Happy Monday! 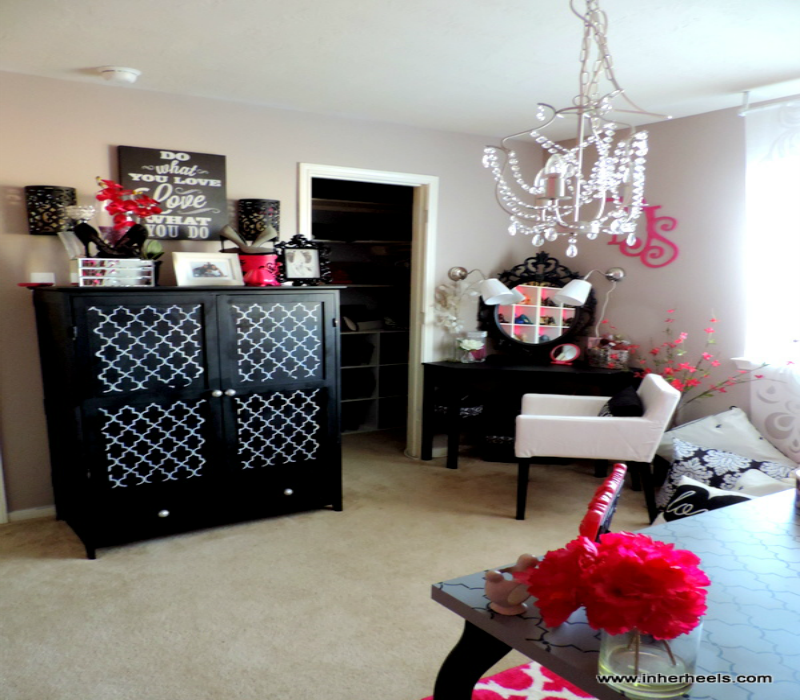 Finally I have finished decorating my mom cave/glam room! This is something that I’ve wanted to do for quite some time but simply never did. Finally, I decided to release my inhibitions and create my own space! I am a very hands on mother who at the end of the day rarely has time for herself. Our children are with us the majority of the time as we rarely have babysitters. So we purchased our home over five years ago in which everyone has their own bedroom in terms of my son, daughter, and the hubby and I. We chose to dedicate one of the bedrooms to our office area as we both were students and held down full time jobs and we of course dedicated the final bedroom to guest. However, our guest room is empty the majority of the time and I figured it makes absolutely no sense to have all of my shoes crammed up in the master closet when we have plenty of square footage, duh! Thus my shoe wall commenced a few weeks ago. I then decided to convert the guest room to my total space. No worries, we still have room for guest! Finally it’s time to stop always putting the needs of others before my own. Especially when doing so isn't appreciated. When I say this I am referring to the fact that we (the hubby & I) have often made purchases based on extended family from vehicles to our home. We’ve always wanted to make sure that we can fit others in. So this is somewhat of an ode to self but not in a selfish manner at all. There comes a time when we must live for ourselves and truly embrace who we are regardless of what others may think. So after five years it’s time to finally put this space to use! I incorporated a few DIY projects in this room. The DIY projects included an armiore, dresser, desk, vanity and chair. I will post the before pics at the end of this post. The armiore pictured above is a piece of furniture that we've had in our home for at least eight years. We no longer used it besides in the guest room so I decided to give it some life by painting it black a few months ago. The original color is a walnut brown. As I decided to transform this room I decided to stencil in a trellis pattern using white acrylic paint and I love it! 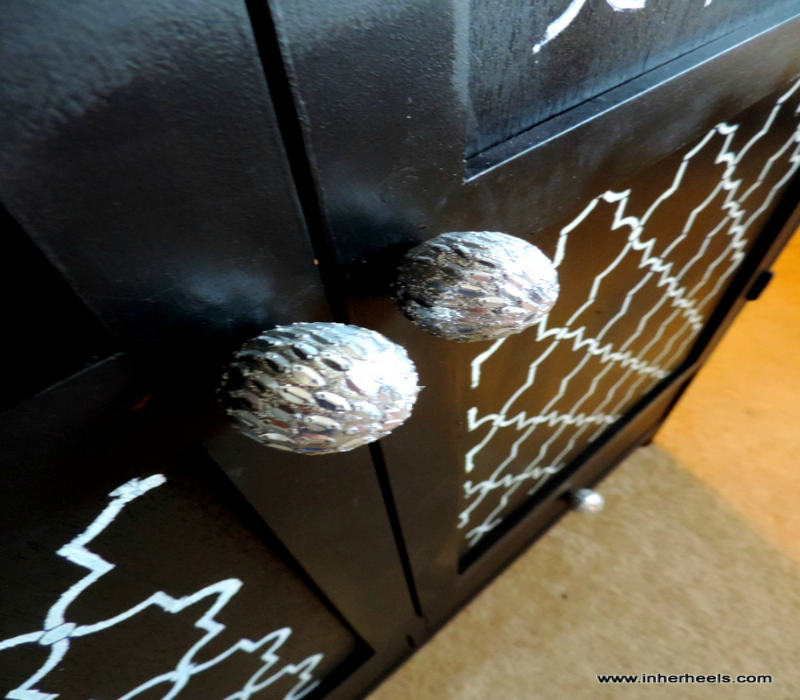 I also added bling hardware purchased at Hobby Lobby to the doors and drawers. Here is a close up of the vanity which is an old inexpensive corner desk that I purchased from Wal-Mart for my little ones for the computer that they share together. However, they've sense gotten their own desk and no longer need the desk. The original color of this desk was also a walnut brown. I added a baroque designed mirror from Ikea to convert this desk into a vanity. I also added lighting to the wall to add light to the vanity area. The lamps were purchased at Ikea as well. Moving on to the window area...I simply wanted to give myself a plush area for those moments that I might feel like vegging out on the floor. Ha! The more pillows the better! Okay so...I had a beautiful chase lounge planned for this room, but errr uh the hubby ever so kindly asked if I were going to move my desk into my "mom cave." I get his point (LOL) so I moved my desk into this room and of course I decided to DIY it! Again, playing with stencil I decided to continue the trellis pattern by using black acrylic paint and the same stencil pattern as used on the armiore. I also painted the legs black because I purchased the grey legs instead of the black legs by accident. Simple fix. This desk is really light and not intended for heavy duty work. It can be purchased from Ikea. To protect the stencil pattern I added a spray gloss sealant very easily found in the paint aisle at Wal-Mart. Here's another DIY! This was probably my favorite DIY of them all! I happened to drive by a moving sale in my neighborhood and scored this fabulous Bombay dresser pictured below for $10! Cha-ching! This dresser was originally a dark cherry wood color. I painted it black and added new hardware. In fact the hardware is exactly the same as the hardware that I added to the armiore except it's black. I had a hard time trying to capture this bling on camera. Nonetheless, I love it! So while we're here let me just say how disappointed I was when I received the ottoman pictured below. I ordered it from wayfair.com under the notion that the fabric was black and white. 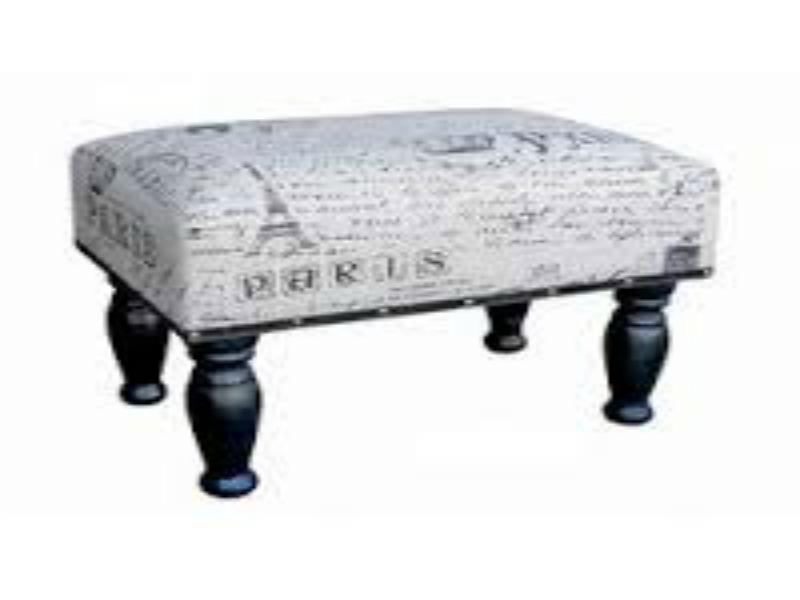 The picture on the site does not accurately display the true color of this ottoman. Sadly, I will be sending it back but had to put it together simply to see the sizing and style in the room. I wish it were truly black and white as pictured on the site! On to the wallpaper! Whew! I took to Google to research wallpaper and found the perfect paper at Lowes.com within five minutes but then I read the reviews and many had noted that the actual wallpaper was taupe as opposed to grey. So I took a trip to Lowes and found that the wallpaper indeed appeared more of a taupe color than grey. So I decided to order wall paper online which summed to the total of $280.00. Ouch! However, I was willing to try it...that is, until the company took five days to ship the order! Since it hadn't shipped by the fifth day I cancelled and took a second trip (without the reviews I'd read in my head) to Lowes. I'm sure that the associate there thought I was a crazy lady but I pulled every roll of wallpaper out (all 19 of them) and compared the colors. I found that lot 005 and 010 were the same hint of grey versus taupe. So keep in mind that it's all in the lot number with this wallpaper! The tile I ended up purchasing was the Allen Roth Spanish Tile pattern which is basically the same trellis pattern I've stenciled on to the armiore and desk. Very simple pre-pasted paper that cost me a whopping $41.96! That's the total of two roles which I didn't use all of. I love it! I have all types of positively affirming items in this room. As you can see I placed my fave quote on the wall. I have a tall plant that will be placed between the accent chair and plant hence the reason for the obvious wall spacing of the quote. I love quotes and this one in particular has had a special place in my heart since I first read it. I wish I'd have had the time to do a video of this room but life happens. Please check out the video below for more pics of my special place! Also check out my facebook page for still pictures! I couldn't capture everything here so please feel free to leave a comment with any question that you may have! Also cehcek out more pics on my facebook page! I shopped Target, Ross, Lowes, Wal-Mart, Ikea, Wayfair.com, and Hobby Lobby to put this room together! Have a fab one!